Across the world, many cultures, included the bronze age and iron age peoples of Europe, have used sacred mirrors, made of metal or sometimes polished stone. 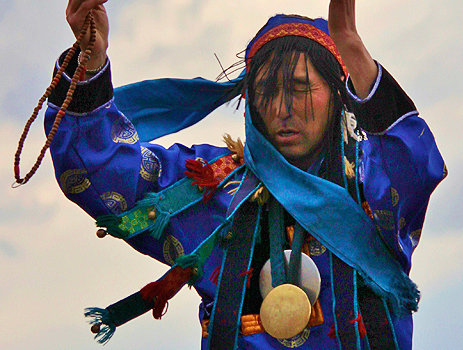 In Central Asia mirrors have a long association with shamanism, Buddhism, Confucianism and Taoism. They are used to bless objects and people, used for healing and divination, and also serve as houses for spirits, and as protective armour for the shaman. They are seen as connecting with the very centre of everything - from where all things manifest. Mirrors can be washed in vodka as a gift to their spirit, and also as a way to clean them - using vodka like this is a bit like smudging them in smoke (which can also be done). Old mirrors can be cleaned and polished if you wish (this is a personal taste thing - personally I like to see their age). Electric toothbrushes and hot water are excellent for cleaning away dirt and lose surface corrosion, as they are not powerful enough to damage the mirror, but powerful enough to remove lose material. After cleaning you could use a metal polish if you so wish, but that comes down to that matter of personal taste again. For more information about mirrors you may wish to read this article. An attractive bronze shaman's mirror in the sought after 'four happiness' design. An well made, old bronze shaman's mirror. A small late, or post, Scythian bronze mirror from the steppes of Central Asia. The mirror is in generally good condition and has some of its original tinned front surface intact. A simple, plain, late, or post, Scythian bronze mirror from the steppes of Central Asia. The mirror is in generally good condition and has some of its original tinned front surface intact. A fairly small example of a traditional Four Happiness mirror. The mirror is in gnerally good condition, but does have a few very small pin holes in one area about 4mm inside of the rim. These are pin holes are old, casued by corrosion over time, and the mirror is stable and perfectly useable. A well made, simply decorated, original ancient mirror. It is well cast, and shows good signs of its original reflective surface. A very nice mirror with a long history, suitable for shamanic practice. A large, old 'Four Happiness' mirror with eight trigram design. The mirror is quite light despite it's size and is good condition, with much of it's reflective face intact under the dirt. This mirror was originally made as for ritual use, and it is suitable for being worn on the chest, or placed on an altar as a dedicated altar mirror. An unusually large, old 'Four Happiness' mirror with central trigrams. The mirror is in generally good condition. This large mirror was originally made as for ritual use, and it is suitable for being worn on the chest, or placed on an altar as a dedicated altar mirror. A very large, old 'Four Happiness' mirror. The mirror is in generally good condition, but it has a small hole hear the centre. The origin of this hole is unknown, whehter it was an original casting mistake or is a result of ancient damge. The mirror is old - no doubnt with a good tale or two to tell - and the hole causes no structural problems at all. It is suitable for being worn on the chest, or placed on an altar as a dedicated altar mirror. An very fine example of a larger than average Qing dynasty shaman's 'Four Happiness' mirror. A very nice example, perfect for shamanism. A very large, old 'Four Happiness' mirror. The mirror is in generally good condition, but it has two small, very old cracks in its rim. These cracks are not very large, and have been there a long time. They do not effect the mirrors use, or its structral strength, and they are not likely to get any larger over time. A very large, old 'Four Happiness' mirror. The mirror is in generally good condition, but it has a small, very old crack in its rim. This crack is not very large. It do not effect the mirrors use, or its structral strength, and they are not likely to get any larger over time. There is also a small dent in the mirror, pushing the front out slightly in a small area. Both the crack and the dent are old damge. 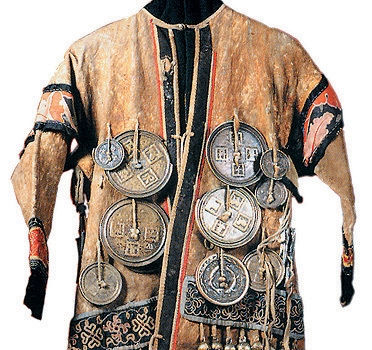 An absolute classic example of a Siberian shaman's 'Four Happiness' mirror. An attractive mirror with a dragon design, suitable for shamanic practice. A small, rather corroded mirror with a zoomorphic design on the back. It could be cleaned up and is suitable for shamanic practice. A small, attractice bronze mirror in the style of ancient Han dynasty mirrors. It could be cleaned up and is suitable for shamanic practice. 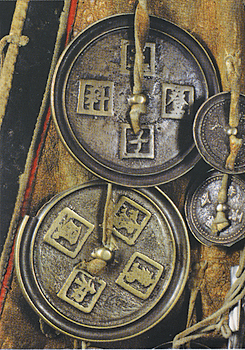 An attractice bronze mirror with a four tigers design on the back. A small modern shaman's mirror from Mongolia Mirrors like this are used by shamans themselves and also given to patients who need mirrors for protection etc. 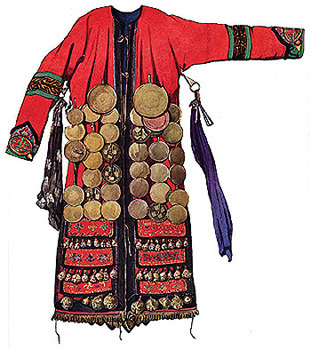 They are also tied onto other shamanic objects and shaman's ritual clothing. A fairly recently made, Tibetan iron mirror (melong). Iron mirrors are fairly uncommon, and are said to be very protective, as iron is considered to be a 'wrathful' material, with a strong power. Melong like this are worn around the neck as a form of protection, and it is ideal as an amulet, but could also be used as a shamanic mirror perfectly well. I have several in stock all around the same size. It is very unusual to be able to obtain iron melong like this, and once they I will be unlikely to be able to obtain any more. A fairly recently made, Tibetan iron mirror (melong) with the OM mantra upon it. A very attractice old Tibetan melong mirror with three finely cast bronzer beads. 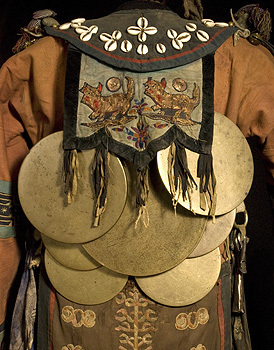 The size of the mirror makes it more of a protective amulet, rather than a larger mirror for use in shamanistic ritual. It has been rethreaded in a very neat way in the more recent past. Ideal for wearing around the neck as a small, every day, shamanic protection mirror. With the addition of the three bronze beads, it is a very special example. An attractice old Tibetan melong mirror. The size of the mirror makes it more of a protective amulet, rather than a larger mirror for use in shamanistic ritual. Ideal for wearing around the neck as a small, every day, shamanic protection mirror. An attractice, very well cast Tibetan melong mirror of some age. The size of the mirror makes it more of a protective amulet, rather than a larger mirror for use in shamanistic ritual. Ideal for wearing around the neck as a small, every day, shamanic protection mirror. An attractice, very well cast Tibetan melong mirror of some age.